Watch this photography tutorial video to learn how to photograph babies using studio flash and double umbrella lighting, with tips on photography lighting and studio set up. Want to learn in depth how to take gorgeous photos of kids? now you can ! 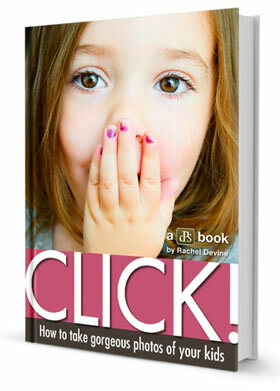 see our review of a New Educational Resource – Click! 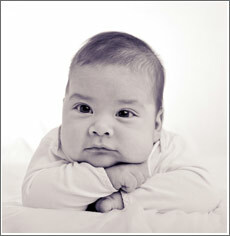 Try to avoid using strobe / studio flash with infants under 3 months old, instead try to utilize natural light. With infants over 3 month old use the lowest power setting to minimize the negative impact. Instead increase ISO and open the f-stop. In my opinion, the high powered strobe flash can have a negative effect on a child’s development. High Powered Strobe is bad for newborns. The first month of a child’s life is the most sensitive period for brain development. When the baby is born, billions of brain cells that have developed while in the womb, begin to make first connections (synapses). Stimulation of the brain begins with sensory experiences. One of examples would be when child is observing the contrast between light and dark shapes. This fires up the neurotransmitters which create connections as they travel from cell to cell forming a network. The network of these connections corresponds to intellectual capacity, memory, problem solving, and language. 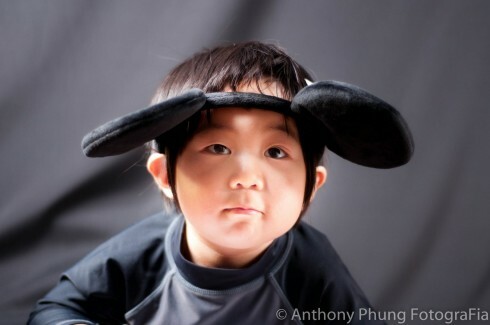 But just imagine what happens when 2500 watt per second of studio flash power is being released into a baby face? I am not an expert on neurology, but in my opinion, flash will create a sudden sensory overload, most likely misguiding neurotransmitters and frying some cells, eliminating the opportunity for successful development. Based on my hypotheses, I would not recommend using flash to photograph newborn babies under 3 month at all. Reserve to natural light, or continuous light instead. What I noticed by observing thousands of babies being photographed, is that baby’s immediate reaction to a flash pop, when the unit is set to 250ws and above and positioned close to the subject is the baby literally jerks and jumps back on each pop. 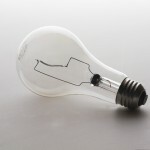 However, by lowering the power below 100ws, it does not seem cause any visual reaction. (In the video, my strobe was set to 1/32 of a power of 320ws unit) so each pop was only 10ws. As you might have notice, Sammy did not exhibit any reaction to strobe pop, at all. Bottom line: Crank up your ISO – and carefully focus so you can keep you aperture open, so that you can control your exposure with ISO and f-stop, as appose to flash intensity. Trust me the grain in the image is definitely better than brain development complications. More info on baby brain development: Making connections helping children build their brains. I used a double umbrella for this photo shoot. Double umbrella is a translucent umbrella and white reflective, or silver umbrella taped together at the ends of the stem. Most of the umbrellas have an option of black cover to be removed. By removing the black cover the white reflective umbrella turns into translucent. The baby will generally only grant you with a few minutes of good behavior. Test your light and exposure prior to the first shot, use a doll or a soft toy to preset focus and exposure. Direct babies attention with a sound “prrrrrrrrrrrrrrr” kind of works well. Happy baby is the one who had his nap, was recently fed, is dry and comfortable. 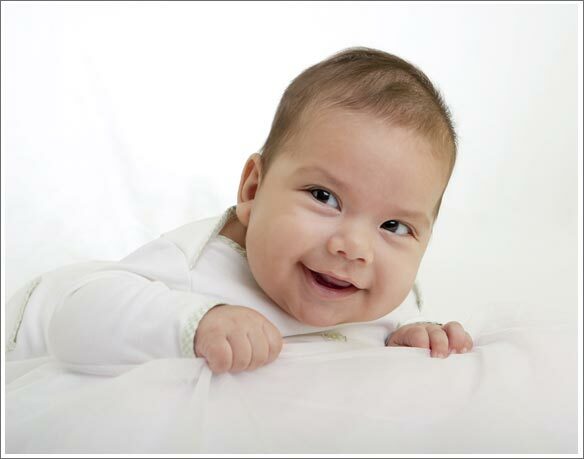 Babies instinctively will produce a social smile – meaning that if you smile at them they will smile back. Ask the mother to stay right behind the camera. DO NOT: This might be obvious but never shake the baby, shaking can cause brain damage. 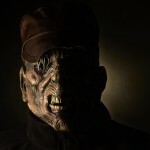 Once again, do not use your strobe at a high power setting. If the baby has any type of reaction to the flash pop, it means that the power setting is too high. Create a soft comfortable and safe environment; make sure that the camera is close enough so the baby is within your reach or within the parent’s reach. Secure the photographing area, in case of a roll over, make sure there is no hard surfaces or objects for the baby to get hurt with. A: 4 inch (medium) Spring Clamp (A-clamps). A-clamps where used to secure background fabric to the telescopic poll. Also one clamp was used to secure the bouncer (H) to the stand (D)Price is about $3 per clamp. You can get them at any hardware store. B: Alien bee B800 flash unit. C: Bogen 2983 Telescoping Cross Bar The most convenient and versatile background holder you will ever find. It can hold any roll of background paper up to 9 feet wide. You can hang all sorts of fabric backgrounds on it with A-clamps. It doesn’t need any special hook up because it can easily be attaches to any type light stand. (one on each end) It has three telescopic sections so it’s easy to transport on location and it’s very durable and light weight. I love it. D: Manfrotto 367B Basic Light Stand. Great heavy duty stand. I used 2 of them is this shoot one was holding the light the other was holding the bouncer. I had a lot of cheap stands in the past and they all died. This stands survive all the abuse and still perform like new. Maximum height is 9 feet. H: Bouncer : Collapsible reflector. It bounces light back onto the subject feeling in shadows. Can be used with any light source. 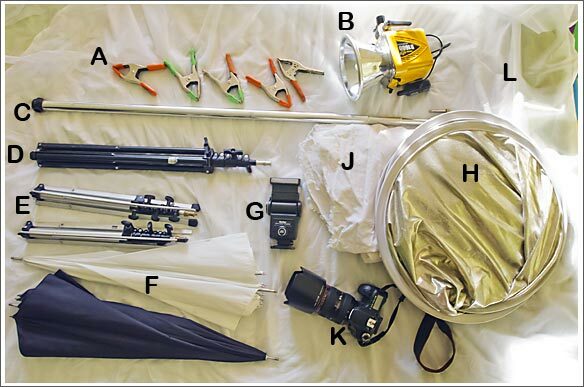 I often use this when I shoot portraits and still life. Sometimes I use it as a background or surface as well on small still life shoots or quick head-shots. One side is white the other is gold. What’s your best / Worst experience shooting babies? 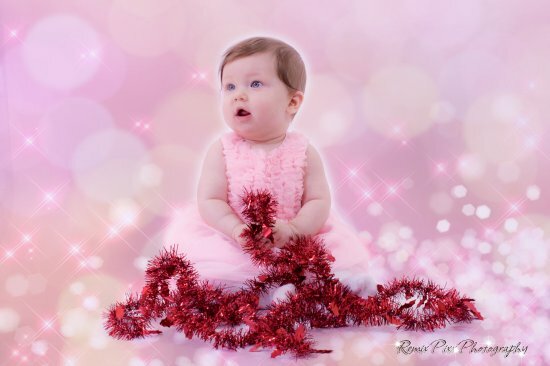 Assignment: Post your Baby Shots here using “Share Your Shot” feature in comments box. One of the pictures from my first paid shoot and I am a novice trying to become a pro so any ideas or suggestions for getting better would be appreciated. Thanks for this very informative article. 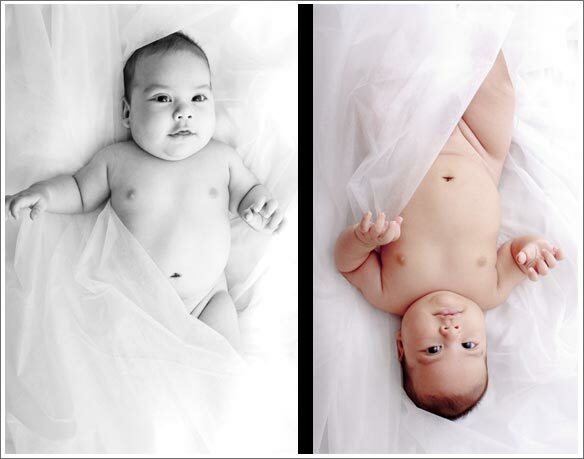 I also want to setup a studio that uses continuous light for baby photography. Do you have any suggestions for the setup? What are your thoughts on LED light for this kind of setup? 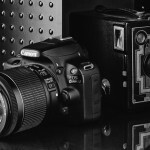 I am a lover of photography and to live my passion and dream, i intend to set up a standard photographic studio. I need information on the type of equipment i require to set up the studio. 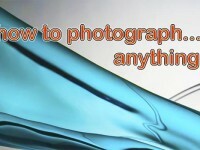 I equally need tutorials on photography because i want to learn photography at a professional level. 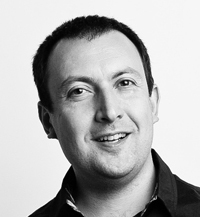 Sasha, thanks for sharing this video. One quick question, how do you trigger your Alien Bee unit? What specifically do you use for connection with your main camera? Sasha, what did you use for remote connection to Alien Bees? Sorry, can’t remove my last post, which duplicates my question. My apologies. Transmitter is attached to the camera(goes on a hot shoe, receiver is attached to the flash. Transmitter triggers the flash from up to 300 feet away. Alternatively a sync cord can be used. Can I use Poketwizard Plus ii ? I am new to photography and was trying to connect everything, but was not able to figure it out. I needed the adapter.))) Found it in the camera store. as a self learn fotografer, please give feedback as I am still on the learning curve and are learning from others fotografers over youtube and here at Learnmyshot.com. this shot was done in my small studio and only 2 strobes was used. Very cute! Very special photograph. on the technical side. The lights could have been positioned a little lower. to avoid shadows caused by ears (or when someone is wearing a hat) but I don;t mind those shadows much they are pretty soft…. also your back light / heir light is a little to hot on the ear. Probably by positioning it higher would give a nicer hair light and smoother light that spills on the face, so the right light lower and the left light higher might be good too. Great shot ! lateral umbrella light (not direct). ..but I missed the eyes catchlight….. Thanks Sasha, my goal is to see pictures the way you do, I mean to know what is good and what is wrong. Now thanks to your critique I see at least three mistakes, lighting is too flat (absence of face contrast),lack of eyes catchlight and lack of clothing texture and also average face expression. My verdict ? this is an average picture……Ciao Sasha Wish You a nice week. why I use gaffers tape: its a cloth tape that’s easy to rip by hand and it’s very strong and when you are done it comes off very easily, it can hold anything….